How can I update MMD 7.26 to MMD 9.31 without losing everything? LearnMMD tutorials. How come my MME will not work after I updated MMD 7.39 to MMD 9.31? If you have already been running MMD and want to keep all of your old files as you update to MMD 9.31, you will want to copy the new files into your old folder … but you have to do it carefully. With each new version, only a couple of files are new or updated. I open the new folder and open each folder with the file view set to DETAILS … so that you can check the Last Modified dates of the files. Any older files do not need to be copied into your existing MMD files. Anything with a new or more recent date needs to dragged and dropped into the appropriate folder inside your MMD folder. Here are the total upgrade instructions I wrote as a method of updating old MMD 7.39 to the latest version of MMD. I was fearless … as I swapped files around, because I knew that I had a full backup of all my existing files on my external hard drive. 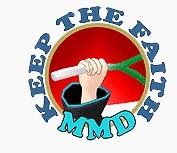 If you do not have a recent backup of your MMD folder … now would be good time to make one! Save a copy to an external hard drive, an online backup server … or copy your old MMD folder to a DVD disc as your back up … just in case something goes terribly wrong “:o). I unzipped the new MMD 9.31 ZIP using my Applocale/7-Zip routine … because I noticed that inside the Pose folder were some files with Japanese text names … and my old XP system won’t get that right if I just use WinZip to unzip that folder. Opened my old MMD folder and removed the good old MikuMikuDance.exe file to the desktop … couldn’t bear to throw it into the trash! Now I opened the DATA Folder inside the New 9.31 folder. I did a Select ALL and COPY. Then I opened the old DATA Folder inside my old MMD Folder and did a PASTE. I got an error message asking if I wanted my new files to replace the old ones … answer YES to All. I did all of that again for the Model folder so that I had all of the latest models. I did all of that again for the Accessories folder so that my new .exe file had the newest version of the Accessories. I did all of that again for the Pose folder … to save those new little VPD files. … even my old desktop Shortcut to MMD still works! Finally … I plugged-in my external drive … with the back-up on it … and opened my backup folder so I could rename my old MMD Folder: “OriginalMMD” … Then I did a Drag-and-Drop of my New desktop MMD Folder directly into my backup drive … so that my next backup routine wouldn’t need to copy the entire 2.6Gb as part of the backup. Close the external drive … and feel secure. You may now trash that original MikuMikuDance.exe file from your desktop. You don’t need it … and … if you do … it will be inside your Backup.